We are excited to announce Pete Myers and Keith Hansen as the January photographers of the month. Pete Myers has been a birder as long as he can remember, growing up near Baltimore, Maryland, and various countries in Central and South America. He has been photographing birds for over 40 years now. After receiving a Ph.D from Berkeley researching shorebirds in Argentina, along the sandy beaches of northern California, and the Alaskan tundra, Pete traveled to the Academy of Natural Sciences of Philadelphia, where he worked until leaving to become Senior Vice-President for Science at the National Audubon Society. Various other opportunities distracted Pete from birds and photography for nearly two decades, but he was drawn back in with the new possibilities of digital photography. Pete is also one of the creators of BirdsEye and BirdLog. In addition to BirdsEye, Pete’s images and writing about birds have been published in numerous venues, including Audubon, Natural History, and American Birds magazines, and was featured on the cover of Audubon’s American Birds four times. 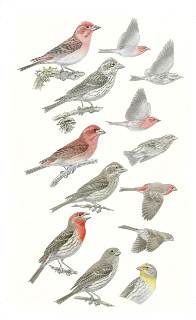 Keith Hansen took up illustrating birds in 1976, his senior year of high school. He explored much of California as a young man, expanding his explorations toward Mexico and Central America, the tropical Pacific aboard a NOAA research vessel, and then a foray to the Andes, the Galapagos, and the Amazon of Ecuador. As a visitor and volunteer for the Point Reyes Bird Observatory, he was introduced to the breathtakingly beautiful region of Marin County’s Point Reyes Peninsula. 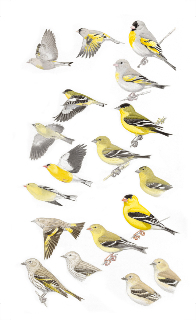 Keith has created bird illustrations for books, scientific journals, magazines, newsletters and logos. His most recent endeavor has been a 14-year project illustrating a book entitled, Birds of the Sierra Nevada: Their Natural History, Status and Distribution authored by Ted Beedy and Ed Pandolfino. Keith lives and works in Bolinas, where people are welcome to visit his studio and view his originals, and purchase prints. Below are two of his plates from that new guide. If you are interested in seeing their artwork in person, Pete and Keith have an exhibit opening January 12 at Commonweal in Bolinas, CA. There is also an Artist reception on January 17th from 3-5pm. Details about their exhibit can be found at the event page. December Photographer of the Month New Photo Site in beta!